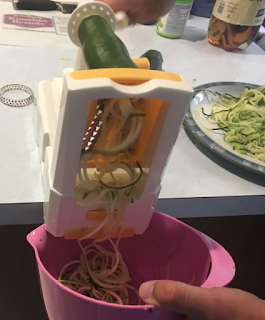 Parental Ideas: We tried a spiralizer and it was amazing! We tried a spiralizer and it was amazing! The Zestkit Tri-Blade Vegetable Spiral Slicer available on amazon is amazing. It has three separate blade attachments and is very easy to clean and was super easy to use. It has a suction cup on the bottom that allows it to be stationary while you use it. We bought three zucchinis to try out and it worked just as intended. It look me a few times to be able to get the alignment just right but it was great and we ate the zoodles! I highly recommend just steaming them briefly or else putting hot marinara sauce on there would actually warm it up enough to be great. You certainly don't want to overcook the zucchini otherwise it will get super mushy! NOTE: We received the spiralizer free of charge in exchange for a review on amazon. We loved it so much we posted the review here! Also, this post contains affiliate links. No other compensation was provided and all opinions are our own.